Thriller books come in many genres of their own. I would put my first book, “The Returning”, into the Thriller Books genre. When I try to describe it, many genres pop into my head. Thriller, Horror, Paranormal, Murder Mystery, Mystery. It’s difficult to pin it to one genre although I think that for SEO purposes it can safely fall under the heading of Thriller Books. Set in the tropical sugarcane fields of North Queensland, Australia, the story is of love and family, murder and revenge. It is also a story of reincarnation. Of malevolent souls returning to avenge their violent demise and others desperate to protect family and loved ones from their rage. City dweller, Jacob Shaunessy, has vivid dreams of romantic interludes with a beautiful young woman. She is familiar to him and yet, he can’t find her in his memories. He knows instinctively that the exotic locations of the dreams are in the northern tropics of Australia. However, he has never been to that part of the world. The dreams lead him to a small town in Far North Queensland, where he and his best mate, Mick Dyson, are drawn deeper into a dark mystery, which reaches back almost 80 years and will plunge them into the depths of revenge and violent death, as the past comes forward in a final attempt to end a deadly vendetta. Talk about your thriller books. “The Returning” keeps you guessing until the final chapters with an unknown killer terrorizing a small farming community and in particular, two families in which Jacob and his friend Mick find themselves inextricably entwined. Jacobs past life comes to the fore to right a terrible wrong, and to protect his family from the evil which is threatening to destroy them. 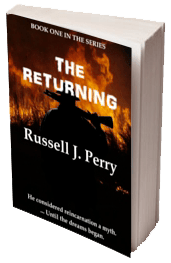 “The Returning” definitely belongs in the category of Thriller Books and has much more as well. Please read the first to chapters here. I hope that you are encouraged to purchase either a paperback or an eBook copy by clicking here.